This is a continuation of my Digital Workflow series. In my previous post, I talked about camera settings and the importance of shooting RAW images. In this article, we will discuss the importance of white balance and my approach to setting the WB after the image is captured. 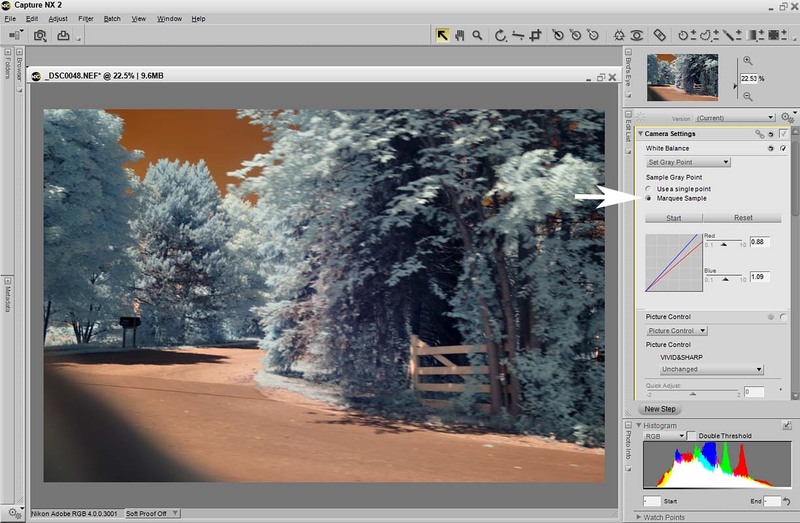 My general workflow for processing IR images is shown below. White Balance (WB) is a much misunderstood process with IR photographers. In visible light photography, WB settings are used to remove unrealistic color casts so that objects which appear white in person are rendered white in your photo. In IR photography, WB is used to transform the invisible IR spectrum to a visible spectrum that we can perceive and manipulate. This transformed spectrum is important for color IR post-processing and strangely enough, for black and white post-processing too. Lets take a look at an image captured with an infrared-converted D90. This camera has a standard 720nm infrared filter installed by LifePixel. The image on the left was captured using the camera's daylight WB setting. 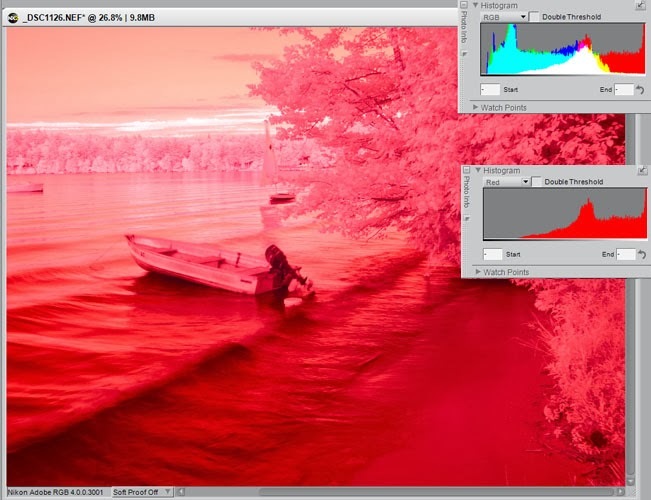 The histogram shows that this WB setting has assigned some of the IR spectrum to the green and blue channels even though these colors are blocked by the IR filter. That's OK.
We also notice that the red channel is jammed up against the right axis. The image shows some red channel overload and detail clipping. The resulting image is flat and lacks detail. 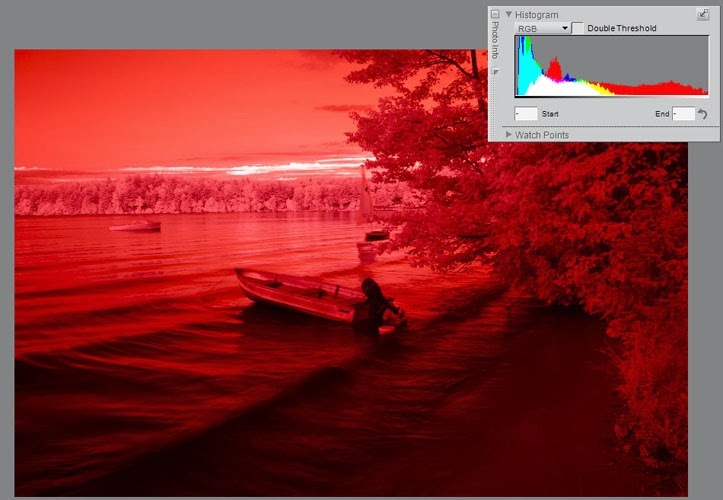 One obvious way to overcome the red channel overload is to decrease the exposure and bring the red channel histogram back to a more centered position. This helps with the whites but we lose details in the shadows (information in the green and blue channels). If you have a camera that can accept a custom white balance, you can correct the overload problem by setting a new white balance. 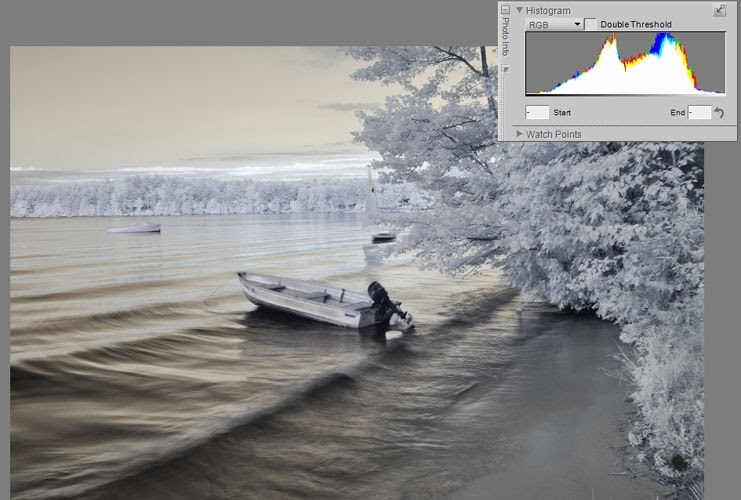 Unfortunately, most Nikon cameras will not accept a proper white balance after IR conversion. In my routine photography with a converted Nikon Camera, I use the custom white balance set by LifePixel during the conversion process. This approach gives me a good starting point in most situations. The color histograms are fairly well centered and the luminescence histogram (white color on the graph) is to the left of center. In my previous post, I mentioned that I do not use the RGB histogram in the camera because the LifePixel WB gives me a good starting point and I am capturing the images as NEF (RAW) files that have all the information the sensor sees. You can also see why I use the luminescence histogram. For my shooting style, a good exposure has the luminescence histogram situated on the left side of the graph but not banging into the axis. 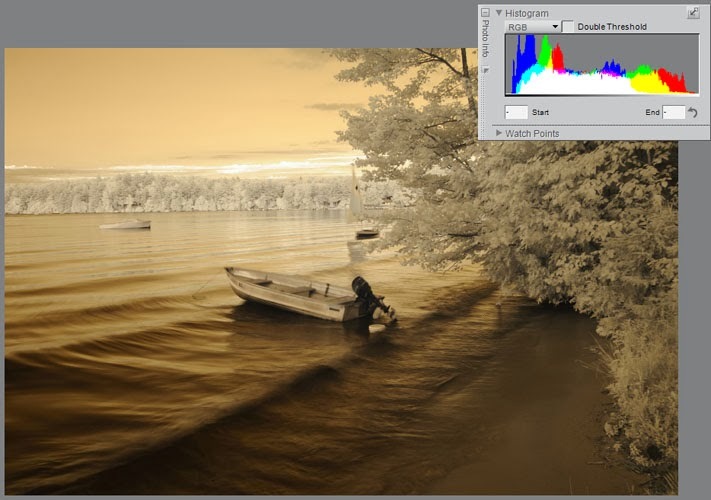 I use Nikon Capture NX2 to further transform the infrared capture during post-processing. This WB shift gives me good tonal separation, good detail, and an image that I can use for further processing. After WB, the histogram is well centered with the luminescence, red, green, and blue channels superimposed on one another. The white balance process has almost completely transformed the infrared spectrum into the viable spectrum. We are using all of the captured data and none of the detail has been clipped. After applying Auto Levels in CNX2. One final step is need to complete the IR transformation. After setting the WB in CNX2, the histogram is centered but there is a gap between the edges of the histogram and the axes. This means that we are not fully utilizing the visual spectrum. The final step in this transformation process is to spread out the spectrum. This can be done in several ways. The easiest is to stay in CNX2 and use the Auto Levels function. From the taskbar at the top, select Adjust > Light > Auto Levels. You can do the same thing in PhotoShop using a Levels layer mask. However, you must save the image as a TIFF before bringing it into Photoshop. This is important because PhotoShop, Lightroom and other programs will not see any of the changes you make if you save the file as a NEF. These picture white balance changes and picture controls are recorded in the Camera Settings area of the NEF file and other programs cannot read that information. 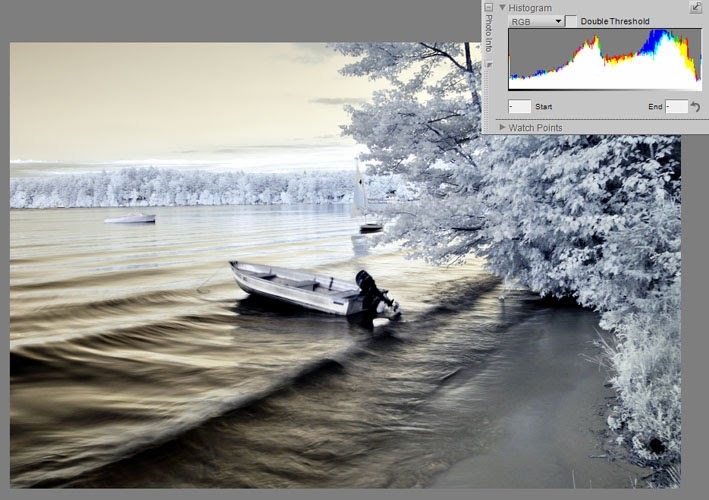 Subsequent post-processing steps use color information to make changes in the image. By transforming the infrared spectrum to a visual spectrum, the software can function efficiently. Black and white conversions also use color information in the conversion process and having a well-rendered color spectrum will allow you to better control the conversion process. The Nikon Capture NX2 (CNX2) program is a full-featured photo editor that uses all of the RAW image data captured by the camera. 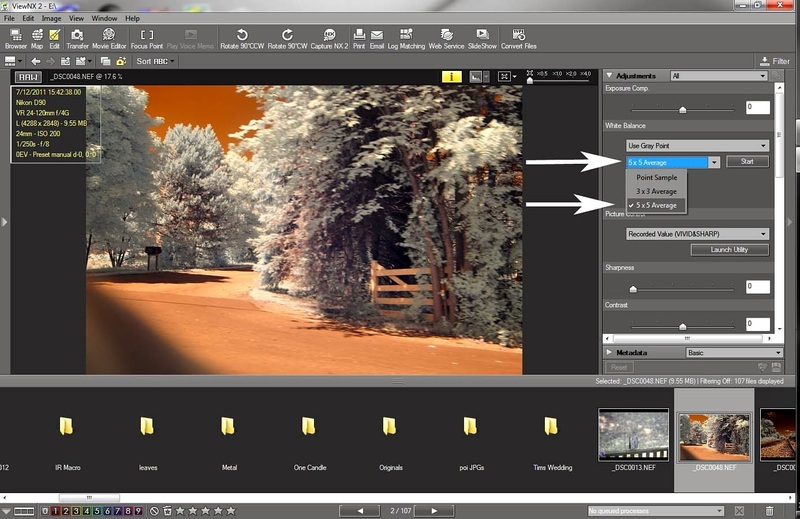 In contrast with other photo editors, CNX2 will apply the Picture Controls you set in the camera. In this way, you will be starting with an image that looks like the one you saw on the back of the camera. If you don't like those control settings, you can change them within the editor. For the photographer using a converted Nikon camera, CNX2 has an advantage over the free View NX2 program because it can set the white balance for any NEF (RAW) image. View NX2 works well when you have an area within the photo that you want to be a neutral gray. Finally, Jason O'Dell has a general YouTube video showing how to set the white balance in CNX2 and copy the white balance adjustments to other photos. The main difference I have with Jason's procedure is that I use the Marquee tool to draw a box around the entire image. LifePixel also has an excellent video tutorial on their website. 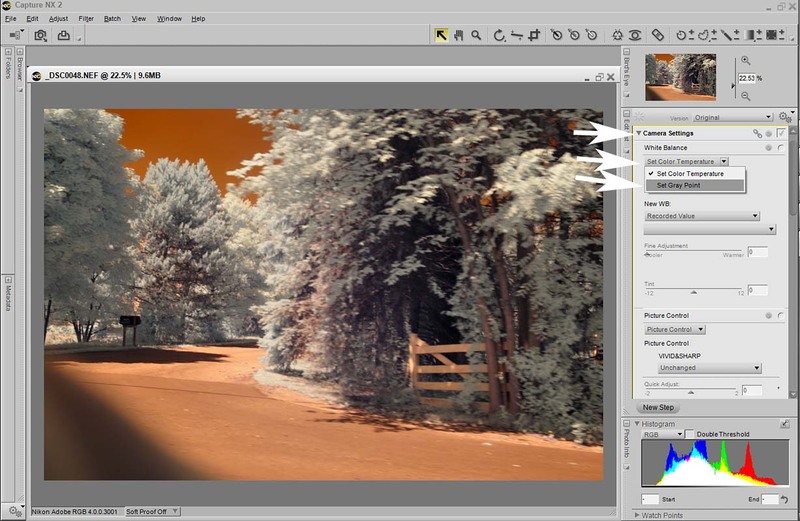 To find it, you must follow the link and page down to the entry on "Infrared RAW file white balance issues & solutions" entry. Click on the triangle next to the Camera Settings header to open that section of controls. Click the start button and use your cursor to draw a rectangle around the entire image. You should see a lot more color and tonal contrast in the image. Save the image as a TIFF file. This is important because PhotoShop, Lightroom and other programs will not see any of the changes you make if you save the file as a NEF. These picture control changes are recorded in the Camera Settings area of the NEF file and other programs cannot read that information. You can forego the TIF-generation step if you prefer to do all your post-processing in CNX2. CNX2 can be used to do the channel swap and BW conversion. 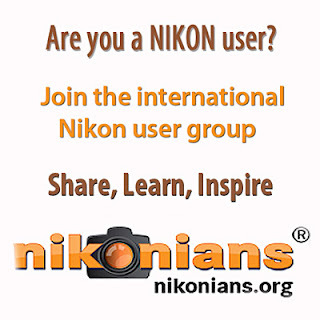 The View NX2 program can be downloaded free of charge from Nikon. Like Capture NX2 above, VNX2 will apply the Picture Controls you set in the camera, Therefore, the image you see with VNX2 will look the same as the image on the back of the camera. 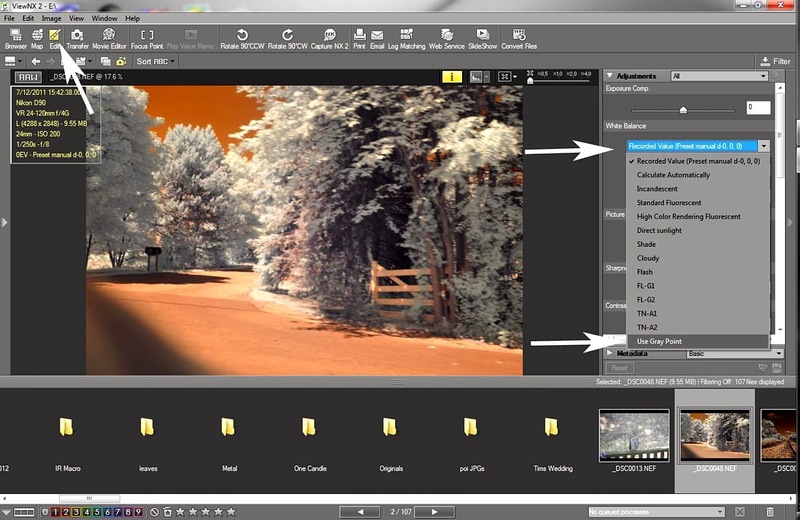 VNX2 has a mini version of the Capture NX2 editor and it can do a pretty good job with the white balance if you have something in the image that should be a neutral gray. Capture the image in RAW format. Open the VNX2 software and highlight the NEF file image. Click on the EDIT button (third from left on the button bar). An Adjustments panel will open on the right. Choose White Balance. In the pull-down box just below this one, choose 5x5 average. Click Start then click on an area you want to be gray. Save the image as a TIFF or JPG file. This is important because Photoshop, Lightroom, and other programs will not see any of the changes you made if you save the file as a NEF. The changes described above are saved in the Camera Settings area of the NEF file and other products cannot read that information. Thank you for this comprehensive discussion of WB as it relates to IR. I couldn't find an email for you so I'll post my question here and hope you see it. Capture NX-2 has been replaced by Capture NX D and a couple of components of the aforementioned workflow no longer seem to be available. The Marquee seems not to be an option for selecting the grey point and auto levels also seems to be gone. Do you have a suggestion for getting good WB using Capture NX D or perhaps I should buy a copy of NX-2 while it's still available. I'm shooting a full spectrum Nikon D3300 and hence have a really back color cast problem in my RAW files. Thanks much. I feel your pain. If you have an area that you want to be gray, you can set the gray point within NX-D but you can't select the entire image like you can with CNX-2. To set the white balance, click on the WB icon on the right panel and use the pull-down menu to change "Recorded Value" to "Use Gray Point." Click on the eyedropper below the pull-down menu and choose an area you want to be gray. If you left-click on your mouse you can select a 10x10 pixel area and get an average gray point value for that area. I am working on a CNX-D "how-to" and it should be posted next week. I'm also working on a DNG profile for Photoshop that I might be able to use without using NX-D. Right now, I plan to use CNX-2 as long as I can but I won't be able to use it if I convert a newer camera.